Do you want to find out more about Teaching English in South Korea? Fill out the form below and we’ll get back to you! Why Teach English in South Korea? If you are in search of a 1 year vibrant experience teaching, traveling and earning great money abroad ($1900 USD to $2300 USD per month), this is the perfect program for you. You’ll be able to save up plenty of money for travel as teachers also get free furnished housing, airfare reimbursement, paid holidays and health insurance coverage. All contracts are for a minimum of 12 months and are renewable. The cost of living is high in South Korea but with such strong earning potential, you’ll be able to travel and bring back savings after your adventure abroad. South Korea is a small country with diverse landscapes and many beautiful and interesting places to visit. Between long weekends and paid leave, you’ll be able to explore the country and even pop over to nearby countries like Japan and the Phillipines. With your end of contract bonus and one way ticket airfare compensation, travelling at the end of your contract is also very affordable. For more ideas, read our resource on 10 Awesome Overseas Vacation Ideas for English Teachers in South Korea. We’d love to offer advice and suggestions for exciting travel experiences in and around South Korea. 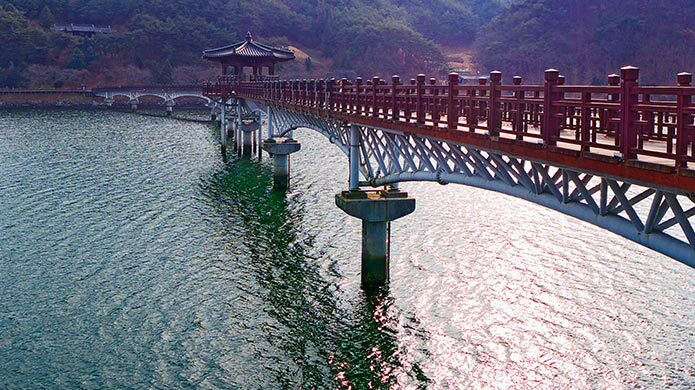 Woryeonggyo Bridge is the longest footbridge made of wood in Korea. 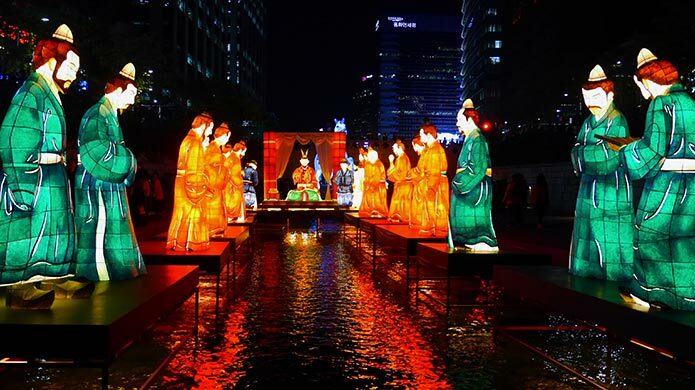 The Seoul Lantern Festival is an annual festival held every November in Seoul in South Korea when hundreds of lanterns decorate the public recreation space of Cheonggyecheon. 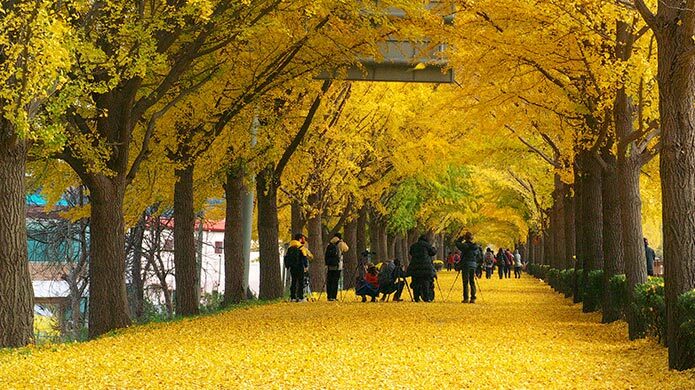 The Asan Gingko Tree Road is lined with towering trees, the leaves of which turn a golden yellow in the fall. Explore South Korea’s grand palaces. Want to teach English in South Korea? Guaranteed job placement. We place you in carefully selected and reputable schools in South Korea. 24/7 support. Once you arrive in South Korea we’ve got your back in an emergency or to answer any questions. Experience your own unique cultural adventure by teaching and traveling in South Korea with TravelBud. Do I Qualify To Teach English in South Korea? You don’t need to have any teaching experience to teach English in South Korea. Placements are for a minimum of 1 year and can be renewed if you’d like to stay in South Korea for more than a year. Must be in excellent mental and physical health, all medical conditions need to be declared. You may not be allowed onto the program if you have ever been diagnosed with any mental, neurotic or emotional disorder. Also, you may not be allowed onto the program if you have had any treatment or taken prescription medication within the last 12 months for any above classified disorders or for the treatment of anxiety or depression even if not officially diagnosed. Chat with us to discuss this in detail. No history of infectious diseases. No narcotic drug or alcohol addictions in the past 5 years. No history of mental/neuro/emotional disorders. Other: Allergies, High Blood Pressure, Diabetes. No dependents. This program is not designed to support teachers who want to go to South Korea with their family/children. We unfortunately cannot accept anyone who intends to go to South Korea with dependents. Married couples may be placed together. Unmarried couples need to be prepared to work at different schools and live apart. 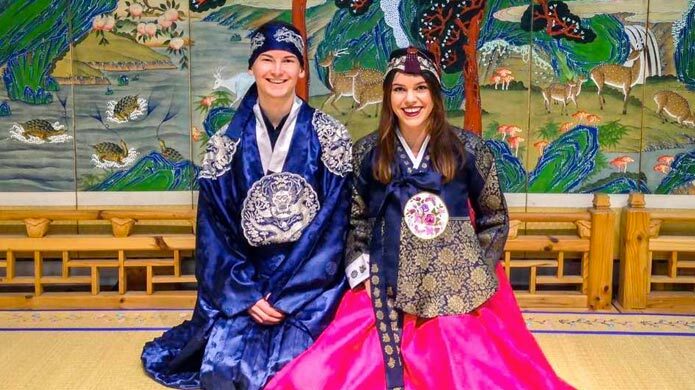 TravelBud’s Grace Martens, trying on traditional Korean Hanbok during her cultural orientation. Experience South Korea’s rich history and culture. That’s why we highly recommend completing the 120-hour in-class TESOL in South Korea. It will give you the best possible preparation and ensure that your students get the best education. Located just a few stops away from the vibrant city of Seoul, the in-class TESOL in Incheon, South Korea offers incredible insights into a fascinating culture, as well as expert training in TESOL from experienced instructors. Cultural orientation highlights include a trip to the majestic Gyeongbokgung Palace, authentic Tae Kwon Do instruction, and Korean language lessons. Students at the In-Class TESOL course in Incheon. The TESOL Course is a 4 week course which takes place in Incheon, South Korea and is tailored specifically for those preparing to teach English in South Korea. It consists of a 1 week cultural orientation program followed by 3 weeks of theory and practical learning. You’ll also get to meet fellow teachers and forge new friendships while participating in exciting cultural activities and excursions. Our next in-take date for the in-class TESOL is 21 January 2019. If you want to teach and travel before this date, then our South Korea Online TESOL course will be perfectly suited and gives you the accreditation you’ll need for teaching English in South Korea. TravelBud provides all accepted applicants with a guaranteed job placement at a reputable school in South Korea. Once in South Korea, you have the option of choosing to do a cultural orientation in Seoul. This course takes place twice a year and classes and excursions will take place over four consecutive weekends. Classes will be held on Saturdays and Sundays in the capital city of Seoul. The in-country excursions are punctuated by in-class language lessons, developed to establish a basic understanding of Korean language. Many of our teachers visit the friends they make during these cultural excursions. As we place teachers across South Korea, this becomes valuable as you’re able to visit your friends in different parts of Korea and fully experience all that the country has to offer. 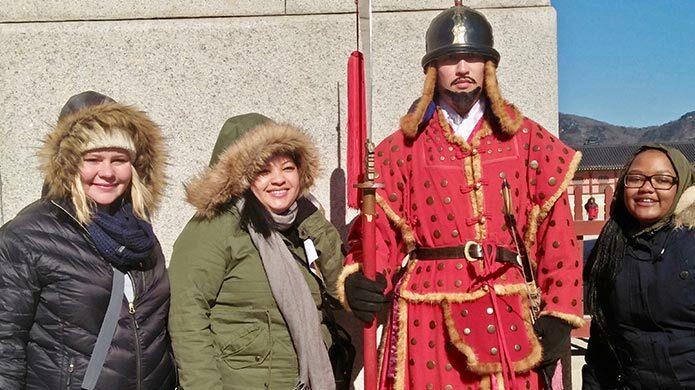 TravelBud Teachers in South Korea on a cultural orientation tour at the Gyeongbokgung Palace. 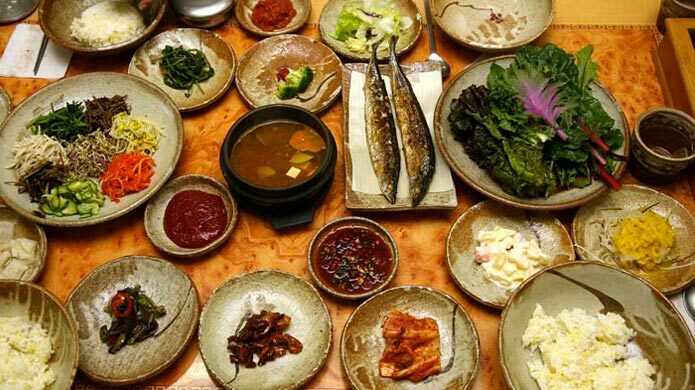 Experience Traditional South Korean food – the land of the side dish! As an English teacher in South Korea, you’ll earn $1900 to $2300 per month. This will comfortably cover your living expenses and also give you the opportunity to save money! The following costs make up the program fee and are payable to TravelBud before you head over to Teach English in South Korea. 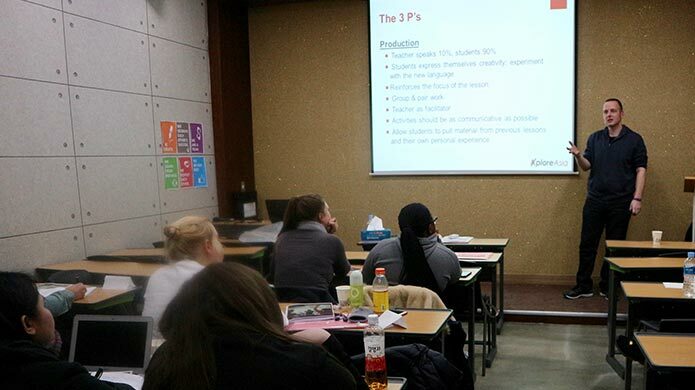 The in-class TESOL courses is tailored specifically to teaching English in South Korea and will give you valuable insight into South Korean culture and the specifics of teaching in a Korean classroom. Payable within a week before your TEFL course starts. Guaranteed job placement in a background-checked and credible school. Payable upon receiving your contact offer. Guaranteed job placement in a background-checked and credible school. Payable 6 weeks prior to departure. TravelBud’s support managers will also check in with you regularly for the duration of your teaching English in South Korea experience. If you want to teach somewhere else after your time in South Korea, we will organise job placement for you – as long as you qualify to teach in that country. Flight prices vary dependent on where you travel from and when you book. Prices can occasionally exceed this range. We recommend booking 2-3 months in advance or more for the best rates. Your school will refund around $1000 towards your flights. Bear in mind that you will be spending 1 to 2 months in South Korea before you receive your first paycheck. You will therefore need to budget enough money to see you through this period. Of course, the amount of money you need depends on your spending habits, but there will be some costs that come up which are unavoidable. In total, we recommend taking at least $1700 with you to start your teaching journey in South Korea. Your school will refund you approximately $1000 along with your first paycheck to recoup some of your early expenses. Depending on your school, you might receive this before or with your paycheck. Depending on where you are placed, you might travel by bus or train. Our in-country partners will assist you with purchasing your ticket. You will also need to take over enough spending money to cover living expenses during your South Korea TESOL course and first month of teaching english in South Korea. Your accommodation is provided during the TESOL course but you will need to pay rent, which will also cover electricity and water costs. Breakfast ingredients and washing machine will be available at your accommodation. Basic supplies will be provided during the course but it will be to your benefit to get creative and add your own materials, at your own cost. Nightlife, entertainment, shopping, weekend excursions. You'll need to buy your own meals for the duration of your course and orientation. You may want to travel in city during your course. Chat to us if you have questions about budget and spending. We realise that moving abroad to teach English in South Korea is expensive at first, but remember that with TravelBud your teaching job is guaranteed. Once you start earning a salary, your living costs will be comfortably covered and you will be able to enjoy your time Teaching and Traveling in South Korea. When can I start Teaching English in South Korea? Students receive their internationally accredited TESOL certificate after completed their course in South Korea. You’ll be greeted by our in-country partners who will facilitate your transport to your accommodation. South Korea is highly urbanised so even towns with smaller populations will feel quite developed. We will always to our best to accommodate your preferences. Marek, an English teacher from the USA, in front of his class. Our placements offer both public and private school options. Grace with her kids in South Korea. You will generally teach for 16 to 20 hours per week. That’s about 4 or 5 hours a day. School hours are usually from about 8am to 4pm and you will be expected to be at the school for the whole day, but you won’t be teaching all the time. You’ll use your extra time at school to mark, prepare lessons and spend time with the kids. If you teach kindergarten, your teaching hours might be different. This will be communicated to you once your placement has been finalised. Are there sports or activities after school which I will need to attend? No, you won’t be required to do anything at school after teaching hours. What type of school will I teach in? Job placements are available in public and private schools. Learn about the difference between public and private schools in South Korea on our blog. South Korean schools are extremely well-resourced and you will have a local teacher to assist you in the classroom. Your books and teaching resources will be supplied, although you may want to get creative and supplement with your own. How long is the teaching contract? Your placement duration is for 12 months or more. Placements are renewable so you can choose to teach English in South Korea for several years if you’d like! Yes, you’ll receive an end-of-contract bonus pay (13th paycheck). Dress code is smart-casual – collared shirts for men and conservative for women. Covering the shoulders is especially important for women but the length of skirts and dresses is less of a concern. South Korea kids are generally well behaved and keen learners. 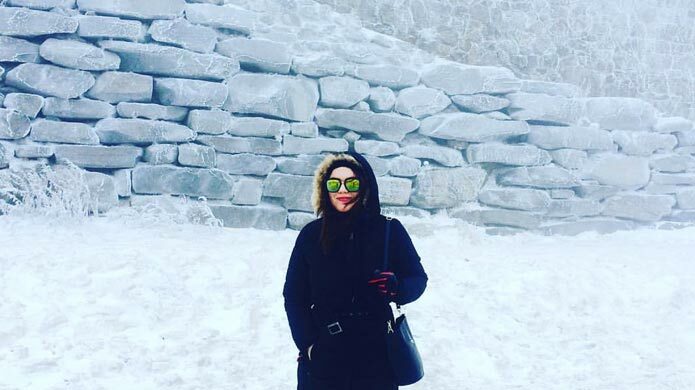 Your accommodation will be booked before you head over to South Korea. Your school will organise your apartment on your behalf so you don’t have to worry about finding accommodation. When you arrive in South Korea, you’ll be picked up from the airport by our in-country partners and they will arrange transport to your accommodation. Another example of South Korean accommodation. Magda, a biology graduate Ontario, Canada in her accommodation in South Korea. Where do I stay if I do the In-Class TESOL course in Incheon? Your accommodation for your 4-week TESOL course is all pre-booked and sorted for you. Have a look at the photos below to get an idea of the accommodation. Incheon accommodation. Clean and tidy. Single room options available for an additional fee. Incheon accommodation. Clean and tidy with everything you’ll need for your TESOL course. Rent will vary depending on where you are living, but is subsidised by your school so it is affordable. If you take the in-class TESOL course, the cost of accommodation is $350 payable on arrival. If you are placed with a friend or partner, you will be able to live together. Otherwise, your school will organise a bachelor flat for you. Let us know what your needs are in terms of accommodation and we’ll assist with finding the best living environment for you. Why Teach English in South Korea with TravelBud? Our in-country partners will be available for the duration of your time in Thailand. If you need any assistance or advice, or in the event of an emergency, we’ll be on hand! If you’d like to move to another program after teaching in South Korea, we will facilitate this at no cost. Prepares you for your teaching experience in South Korea and introduces you to Korean history, language, politics and culture. What do TravelBud staff and teachers say about safety in South Korea? Our teachers in South Korea (both men and women) report feeling extremely safe in the country. Levels of crime are very low and public services such as transport are very efficient and very safe. Public transport is efficient and safe to use. The police in South Korea will treat you as well as you treat the law. Petty crimes involving brazen debaucherous behaviour are not tolerated and can be dealt with severely. Make sure that you stick to the law and you will find the authorities very helpful. Keep an eye on your belongings at the airport when arriving and leaving, as this is one place in the country where petty theft or pickpocketing is sometimes reported. How much does it pay to teach English in South Korea? If you are in search of a 1 year vibrant experience teaching, traveling and earning great money abroad ($1900 USD to $2300 USD per month), this is the perfect program for you. In the local currency (paid into a local bank account you will set up in your first month), it is around 2.1 – 2.3 million Korean Won. Is English spoken in South Korea? Yes, English is spoken in Korea. There are different levels of English- in cities like Seoul you will encounter people with a high level of English, as opposed to smaller cities or towns. To work for bigger companies in Korea (which is a dream of many Koreans), you will need to have a good handle on English, but it isn’t as widely spoken as Thailand, as there isn’t such an enormous tourist sector. In South Korea, it is good to note that there are certain social restrictions to speaking English, especially to a foreigner. Korean people often believe that your level of English directly indicates your economic background, as having a high level of English will mean that you attended classes at a private academy, or that you have travelled or lived abroad. For this reason, many Koreans are often shy or reluctant to speak English, even if they can. Are teachers in high demand in South Korea? Why? Native English-speaking teachers are in high demand in South Korea, mainly because the population is in a tight competition with their peers for jobs and other opportunities. Many young students aspire to study/live abroad, so the parents are more than willing to invest in native speakers to teach their children. The overall hope for South Korea is to train Koreans to replace foreigners. They want the level of English to rise for Koreans, who could eventually become English teachers and eradicate the need for foreign teachers. The reasons for this are largely due to a patriotic outlook from Koreans, but also the fact that they do have a very high level of youth unemployment due to high competition for jobs based on the population size versus job availability. Do students have to learn English in South Korea? Yes, it is compulsory at their public schools. On top of their public schooling, many children attend private English academies after school to improve their English. Do you need a degree to teach English in South Korea? Yes, you will need a Bachelor’s degree in any field to teach English in South Korea. You may also be accepted if you have a diploma in education specifically. The basic structure of the school system differs between language centers/private schools and public schools. Language centers/private schools have a bit more flexibility in terms of the curriculum, use of textbooks, and so on. Teachers also generally teach smaller class sizes with students of similar English proficiency levels. Public schools will generally have a set curriculum and textbook work. Class sizes are generally bigger, and students will have varying English proficiencies. Work hours for language centers/private schools are in the afternoons on weekdays, and weekends. Public schools will generally be from around 7:30AM to 4:30PM on weekdays. Read our guide on the Difference between Public and Private schools in South Korea on our blog. How much money can I save teaching English in South Korea? It is generally up to your lifestyle (as Western foods, alcohols etc are far more expensive). However, because you rent is paid for entirely by the school, all you really have to pay for is food and transport- both of which can be done very inexpensively if you live like a local. You would probably spend about half your pay without creating any limitations for yourself, but can save more if you live frugally. On average, you can save about $800- $1000 per month. You will also get a severance package at the end of your contract which is one extra paycheck for the amount of years you have worked there, so even if you only stay for 1 year, you will always get $2000 at the end of your contract. Do schools in South Korea accept Online TEFL/TESOL certificates? Yes they do. We recommend the CultureRoute Online TEFL/TESOL Course if you’re looking for an internationally accredited, interactive and highly rated online TEFL/TESOL course. How long does it take to get a TEFL/TESOL in South Korea? You have 2 options for South Korea in terms of a teaching certificate. You can do an online TEFL/TESOL course that has to be accredited and at least 120 hours in duration. 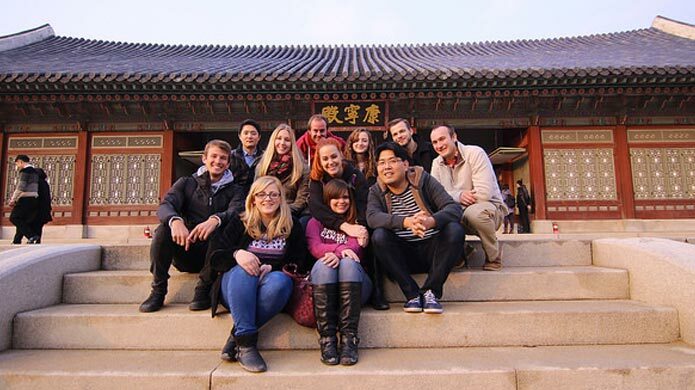 For an in-class TESOL, you can view our South Korea TEFL course. What is the main religion in South Korea? The religion is predominantly Christian (which stems from the involvement of the Western world, particularly the US after the end of the Korean war in 1953. There are a number of Buddhists as well, but the majority is atheist. When you arrive in Seoul, you can count on airport pick-up and travel assistance to your accommodation. We can place teachers in: Big or small cities, South Korea is highly urbanised so even towns with smaller populations will feel quite developed. You can teach: Kindergarten, Primary (elementary and middle) or High school. 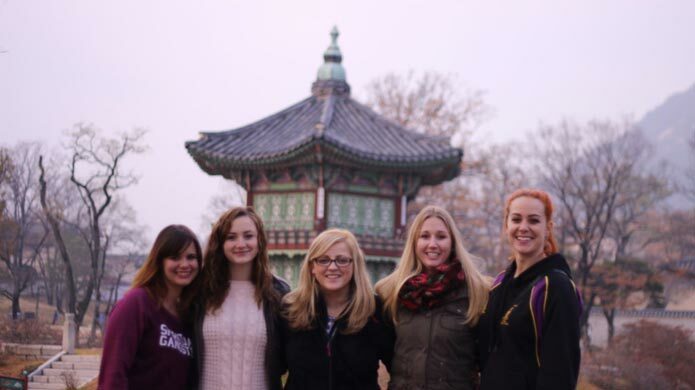 Read our guide to placements in South Korea on our blog. Watch the videos below answering all our frequently asked questions about Teaching English in South Korea. What is the airport like in South Korea? 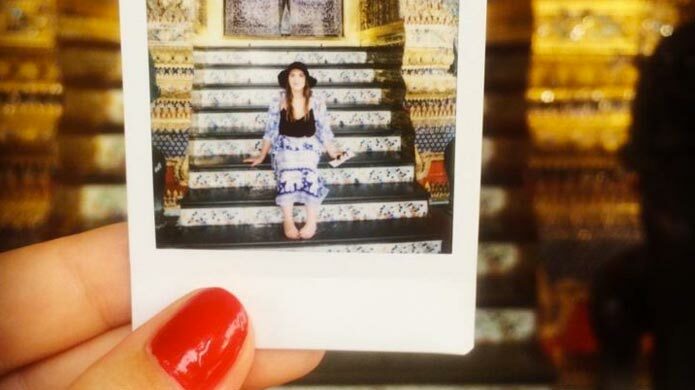 Can you get a job without a TEFL course? What did you most enjoy about the TEFL course? How many hours per week do you teach? What other financial benefits are there when Teaching English in South Korea? Can I travel while I’m teaching English in South Korea? What are the best places you can go to in Korea? Why go through TravelBud to Teach English in South Korea? How is the WiFi in South Korea? How do I know a school is reliable? What happens if something goes wrong once I’m in the country? What will my lifestyle be like? How is the foreign community? Is it safe for woman in Korea? Why would you recommend teaching English in South Korea? Looking back, I am sure that if TravelBud was not there for me I would honestly not be here today. Even though at the time I was based in Tanzania , TravelBud were so good that it didn’t matter where I was. I still got the support I needed. They were so friendly, and caring that they made a process that would otherwise be quite stressful very easy and even enjoyable. I want like to extend my sincerest gratitude to all the staff at TravelBud very their help and assistance in helping me to have an amazing experience Teaching English in South Korea. Their support is also carrying one even now that I am in the country and working. I was very satisfied with their hands on approach in helping me teach abroad and would highly recommend them! Where Will I be Placed While Teaching English in South Korea?